But we’re more than just a hotel near El Paso International Airport. We’re also here for you when you’re looking for El Paso hotels near Fort Bliss. Other attractions and points of interest nearby include El Paso County Coliseum, El Paso Zoo, Cielo Vista Mall and Sunland Park Racetrack and Casino. If you’re here with the family, you may want to take time to enjoy Western Playland Amusement Park and Wet 'N' Wild Waterworld. coffee maker, desk and more. May we be your first choice of accommodations in the El Paso Area? At Quality Inn & Suites Airport, we want to be the hotel in El Paso TX to which you always turn first. How may we serve you? Business Travel :We truly enjoy serving business travelers – like you. Are you looking for a hotel in El Paso near Fort Bliss Army Base for your business travel needs? Would a motel near El Paso with a comfortable, affordable experience make your travel better? Our top choice of hotels near ELP Airport is designed with the unique needs of business travelers in mind. When you choose to stay with us while on business, you're benefiting from one of the best. Turn to us with confidence when you need a business hotel that will more than meet your expectations. We're here for you when you need us at our Quality Inn and Suites. Why not book now? 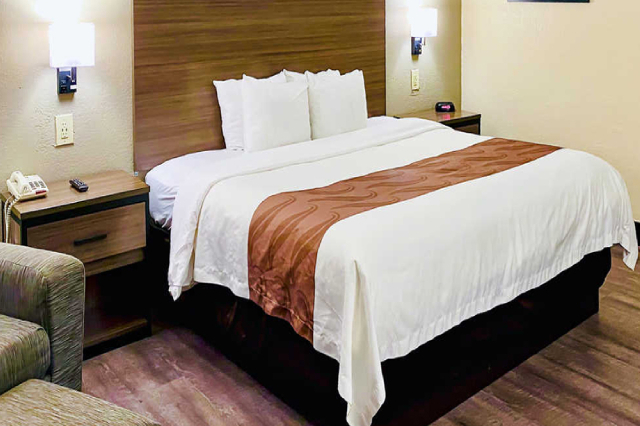 Family Travel :At this Quality Inn and Suites, our family looks forward to the opportunity to serve your family – whether you're looking for El Paso hotels downtown but can’t find a good rate, want hotels near ELP Airport – or need something else entirely. When family travel takes you to our region, it makes sense to stay in comfort and style where there are plenty of amenities sure to satisfy everyone. It makes real sense to stay at the best of the hotels available, our affordable property. At our hotel, we provide all the amenities you expect and so much more. It’s a smart decision to book with us now – and we’re ready to serve you. Comfortable Stay :Nothing means more than comfort. You deserve the most comfortable stay possible. You deserve the very best and should settle for nothing less. We're the most comfortable and most affordable hotel in El Paso TX and the top choice of hotels near both downtown and the ELP Airport. As your first choice in this region, we feel an obligation to provide exceptional comfort at a fair price. Plus, we take real pride in offering amenities that enhance comfort as well, including free wifi and a handy business center! Book with us and you'll be glad you did each and every time you look back on your great trip to the El Paso area. Safe and Peaceful Stay : Without safety, what do you have? Whether looking for hotels near ELP Airport or perhaps the right selection of hotel in El Paso near Fort Bliss Army Base – or whatever brings you to the area – safety and peace of mind must always come first. While you may find good rates at other hotels in our part of Teas, can you be sure they share our commitment to safety and peace? You can be certain things will go well when you choose our hotel in El Paso. Staying at our hotel is a great choice sure to lead to exceptional value, amazing comfort and the safest, most peaceful stay you can imagine. Try Franklin Mountains State Park if you want to get out of town and explore the surrounding area. Staying with us puts you close. El Paso Zoo is spacious, covering 35 acres and including well over 200 species. Why not have a look at it while you’re in the area? Wyler Aerial Tramway can take you into the beauty of the mountains to see amazing things. Stay in amazing comfort while you explore the area. Quality Inn and Suites is near Chamizal National Memorial along the US-Mexico border, which is emotional and moving – and worth seeing.